How do we know Adolf Hitler authorized the Kristallnacht pogrom? Adolf Hitler did not know about and did not authorize the Kristallnacht pogrom. Holocaust denier David Irving asserts that Josef Goebbels, the Minister of Propaganda, initiated the pogrom without Hitler’s knowledge or permission. Available evidence shows that Adolf Hitler knew about and authorized the Kristallnacht pogrom. In the early evening of November 9, 1938, Josef Goebbels informed Hitler of the first stirrings of widespread pogrom activity. Hitler gave his authorization for the violence of Kristallnacht to be continued, even increased. Nazi German diplomat Ernst vom Rath was assassinated by a Jewish teenager in Paris on November 9, 1938. Vom Rath died at 5:30 p.m. By early that evening, several cases of antisemitic violence had already take place in Germany. Josef Goebbels, the Nazi Minister of Propaganda, was informed that disturbances had broken out in two locations in Germany. Hitler and Goebbels discussed these incidents before attending a dinner together at the Old Town Hall in Munich. Several eyewitnesses reported that Goebbels and Hitler had an intense discussion together at dinner that night. 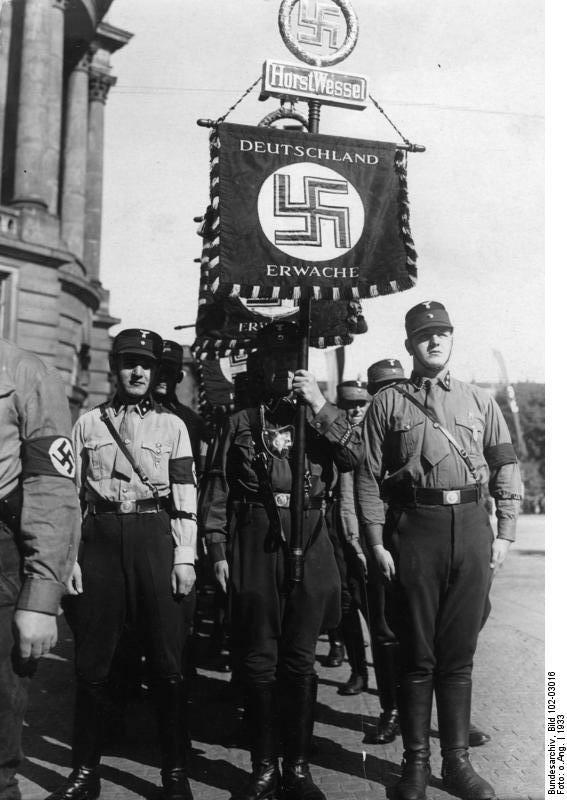 Goebbels’ diary entry for that day read: “I go to the Party reception in the Old Town Hall. Colossal activity. I brief the Führer about the matter. He orders: let the demonstrations go on. Withdraw the police. The Jews must for once feel the people’s fury. That is right.” Hitler left the dinner around 9:00 p.m., strangely allowing Goebbels to give the speech that Hitler himself had given for the previous five years. The report of the Supreme Nazi Party Court, held after the pogrom, stated that Goebbels gave a rousing speech in which he informed the Gauleiters (party district leaders) of the disorder already erupting in parts of Germany. Attendees recalled that Goebbels invoked Hitler’s approval of the violence, including future violence against Jews: “on his briefing, the Führer has decided” that future demonstrations should not be stopped. The Gauleiters at the meeting understood their orders as such: “the Party should not appear to the outside world as the originator of the demonstrations, but should in reality organize them and carry them out.” After Goebbels’ speech, they rushed to the telephones and issued orders to their subordinates across Germany that they should directly incite and/or encourage the violence. Contrary to the claims of Holocaust deniers, Adolf Hitler knew about and authorized the Kristallnacht pogrom. Reputable scholars assert that the evidence points to the following conclusion: Goebbels fully informed Hitler of antisemitic disturbances in the early evening of November 9, 1938; during his dinner with Goebbels, Hitler authorized more widespread pogrom activity. This activity was organized and encouraged by the SA (Stormtroopers) and SS. Hitler left the dinner so that the international community could not hold him directly responsible for the resulting destruction and violence. With Hitler’s blessing, Goebbels gave Hitler’s keynote speech for him, rousing the Gauleiters into action. They put the plan into effect promptly after his speech. Diary entry of Josef Goebbels, November 9, 1938 as cited in Richard J. Evans, David Irving, Hitler and Holocaust Denial, Section (4)(4.3)(c)(ii)(A)(3-5). Richard J. Evans, David Irving, Hitler and Holocaust Denial, Section (4)(4.3)(c)(ii)(B)(5). Richard J. Evans, David Irving, Hitler and Holocaust Denial, Section (4)(4.3)(c)(ii)(C)(3).